A peaceful and convenient oasis awaits your enjoyment in this studio directly on the beach at Beachside Two. This spacious studio features luxurious Tommy Bahama furnishings together with an upgraded FULL kitchen with granite counter tops and stainless steel appliances. This large studio style condo features 650 square feet of relaxing space, flowing out onto the large balcony providing both privacy and openness as the unit is located at the end of the building with the large landscaped lawn beyond. Our easy access unit is on the first floor. The sugar white beach is just steps away beyond the spacious pool. Free wireless Internet is available throughout. There is a king size bed and the sleep sofa in the sitting area provides additional sleeping space if needed. The wall of windows shows the spacious patio and beautiful surroundings. Bonus, washer/dryer are in the unit . There are 2 beach chairs and umbrella in the unit for your use. Amenities: TV, DVD, washer, dryer, dishwasher, microwave, etc., fully equipped with linens provided (excluding beach towels). THIS WILL BE A VACATION WHERE MEMORIES WILL BE MADE! DESTIN MEMORIES, is an independent company that is not affiliated with, sponsored by or associated with any entity containing the word “Sandestin.” Any use or reference to the word “Sandestin” is used in the factual sense to geographically identify a property or location and not to suggest any affiliation with any SANDESTIN® branded entity, product or service. Bette was amazing. She helped me with a last minute booking for this condo. 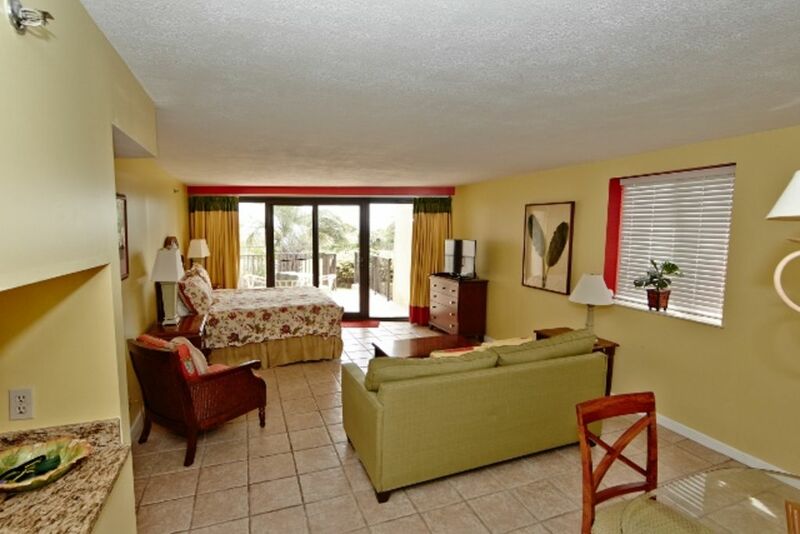 The condo was very clean and is just steps away from the pool and the gorgeous beach that Sandestin has to offer. I was not aware until we arrived that this condo resort has a tram service as well as bars and restaurants literally walking distance from the condo. The only complaint I had was the bathroom. The shower drained very slowly and would sometimes give off a sewage smell. But, once the shower was over and the water was no longer running it would drain and the smell would go away. All and all I really enjoyed my stay and have stored Bette's number into my phone. She was a great help and so very kind. And we have addressed and fixed that bathroom issue. I wished you had contacted us as we discovered the issue when we went to clean. All is well now. So glad you found this unit comfortable as it is quite spacious for a studio that has everything a one bedroom has. I don't know what was the clean issue as I did not receive a call nor is there a comment. Please come back. Great condo but even a greater staff. We ran into two small issues while at the condo and Bette had a solution within minutes. Have booked with her before and will continue in the future! We loved the location. We like the price and had a very good experience using VRBO and will use them again. Thanks to Betty for all her help and being such a good agent. This trip started with a "BANG". Bette was very help as we decided to go ahead and start our vacation just before the tropical storm hit. The condo was very nice and equip with most items needed during our stay. Very nice being on the 1st floor for easy access to the room.